A barren, rolling landscape and a ring of stones. Evidence of mysterious ritual feasts and astrological signs. The true purpose of the site long forgotten. It’s an image that conjures up ancient Celtic druids on the English heath, but ring sites aren’t unique to the early cultures of the English Isles. 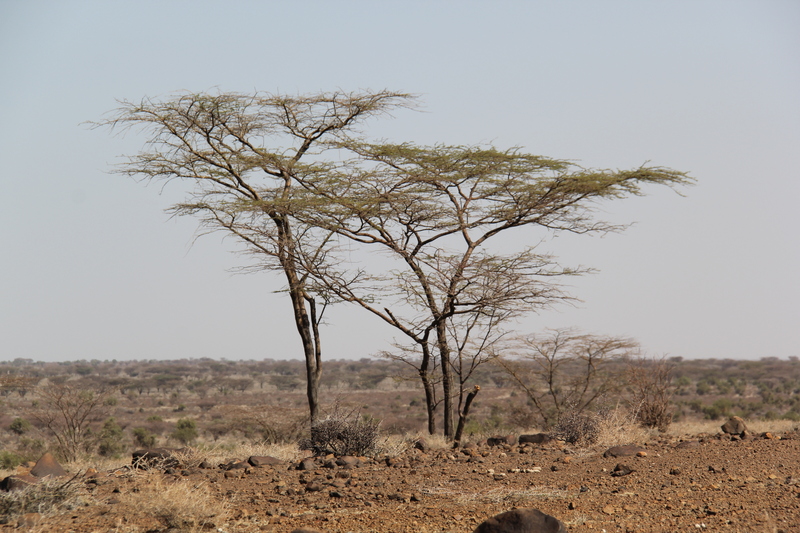 The Turkana Basin has several “pillar sites” and these monumental works and their more familiar European companions offer insight into cultural and community dynamics of the Turkana Basin when both were in dramatic flux. While maybe not as visually striking as more famous standing stone sites around the world, the Kalokol Pillar site is a fascinating glimpse into the culture of ancient Turkana pastoralists as they first move into the basin and transform the primary subsistence strategy of the entire region. Standing along the road between Lake Turkana and TBI is the Kalokal pillar site, a ring of basalt stones standing over a platform of smaller, rounded stones. 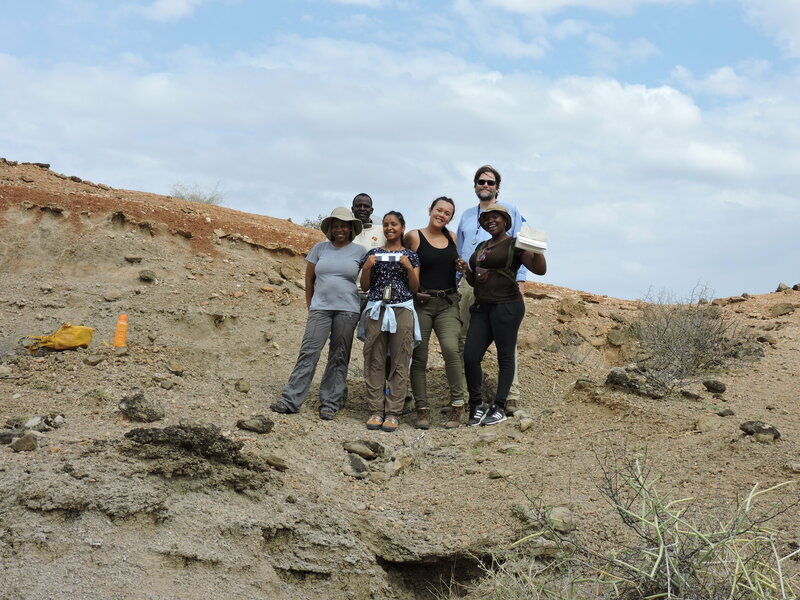 The ring site isn’t on a Stonehenge scale, but what makes the stones special is their construction likely coincides with the first people to bring herding, or pastoralism, into the Turkana Basin. 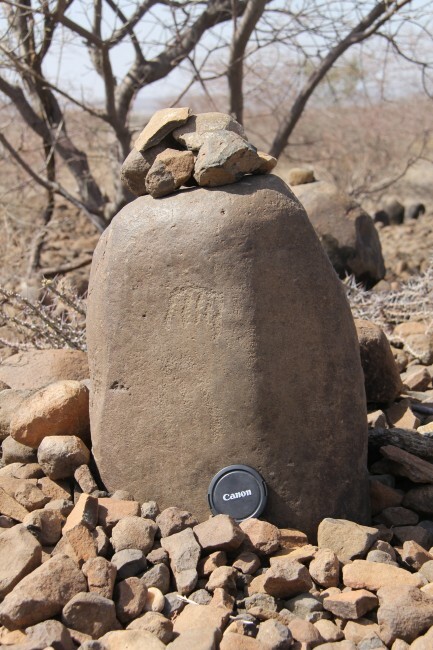 The hunter-gatherer culture that preceded the herdsmen didn’t invest the effort or have the population to lug the large pillar stones from distant hills or haul an estimated 20,000 of smaller stones to the site. Presumably the members of the ancient hunter-gatherer society were too thin on the ground and moved around too much to mark sites with monuments. The pillars were lugged in by dedicated herdsmen and women. The small piles on top are recent, left by modern passersby as a sign of respect. The platform below has risen with the addition of these respectful offerings to the "dead." The crazy thing about this site is we have no idea how it would have been organized. Pastoral societies tend to be pretty egalitarian and it's difficult to orchestrate a large community effort when everyone is moving around on the landscape. 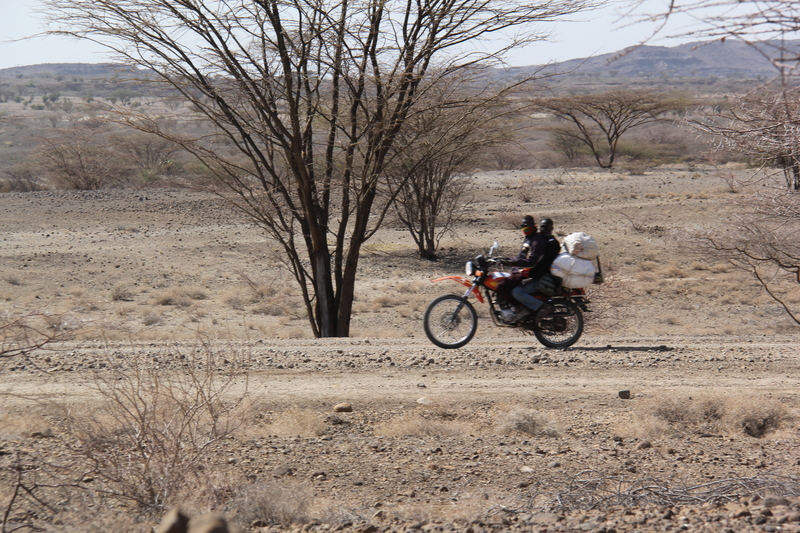 What’s odd about the Turkana Basin pillars in that pastoralists aren’t exactly sedentary people either. They tend to lead or follow their herds to different regions with each season, always seeking the best food for the livestock. 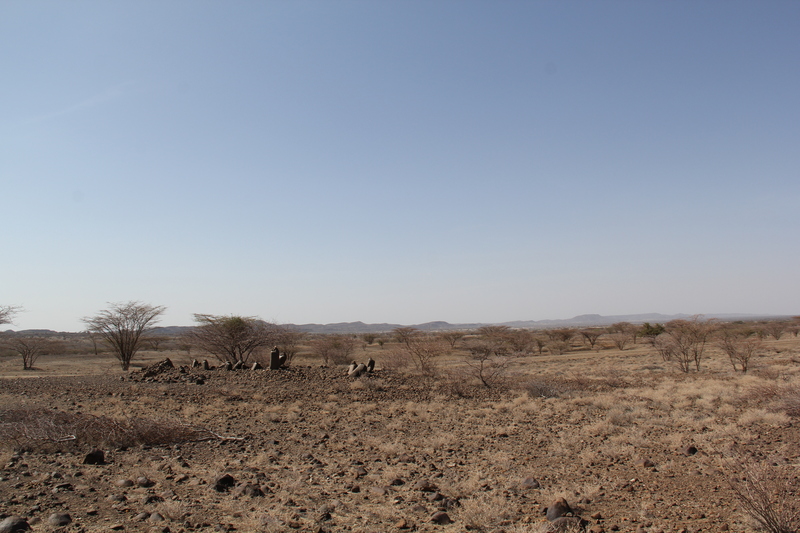 Pastoralists don’t always return to the same place each year, so the presence of a permanent monument in the area is very weird and maybe belies a special significance associated with the open desert patch in the ancient past. 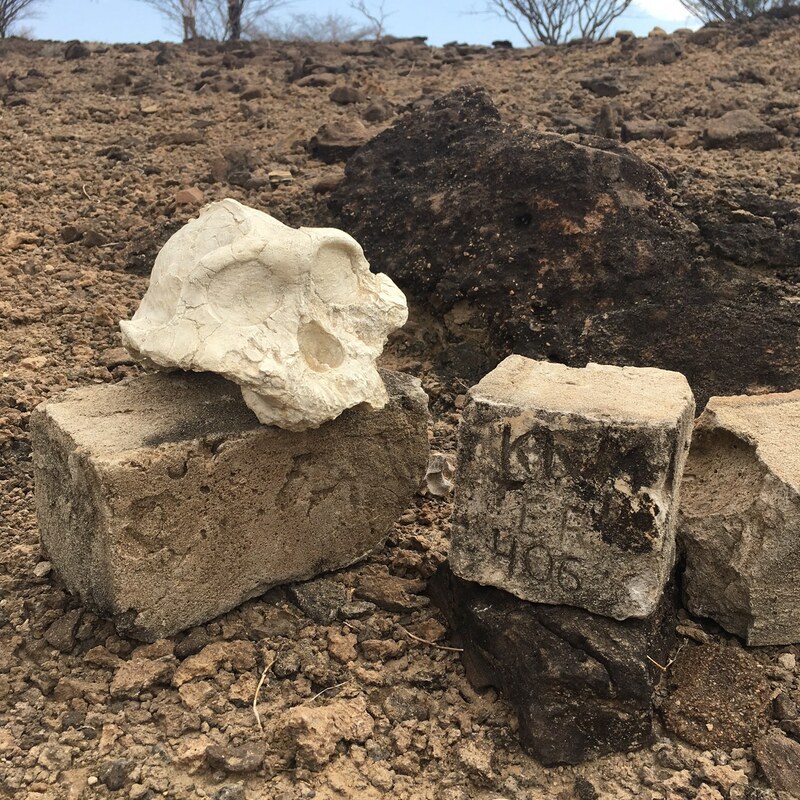 Dr. Lisa Hildebrand of Stony Brook University spent a recent field season excavating the pillar site to try to sort out what it was used for in the middle of the rocky desert. 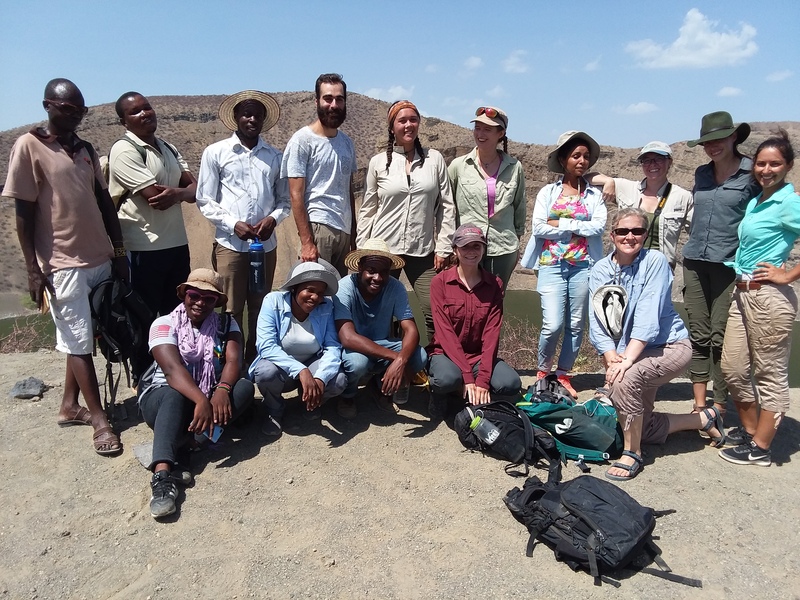 Dr. Alison Brooks took the class to see the monument after a morning of field excavation to consider the possible purpose the site to people 4,000 years ago. Standing near the stones, ancient indicators that someone (or many someones) once found this area compelling or interesting, Dr. Brooks walked the students through the various interpretations archaeologists have made of the site. One group thought the stones were an ancient astronomical observatory constructed to watch for an alignment of stars important to the Egyptian calendar. 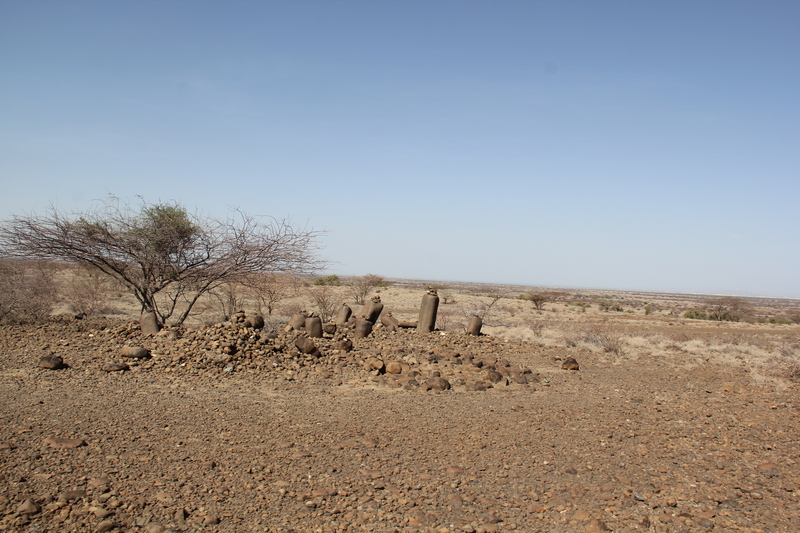 More recent work by Dr. Hildebrand has put this idea to rest by showing the Kalokol pillars don’t line up with the stars they’re supposed to be tracking. There is some evidence of a floor under the pile of stones with animal remains, maybe indicating a ritual feast. There’s still work to do, but it’s a start for getting inside the imagination of the first people to bring a new subsistence strategy into the basin. What did the people who built the platform and set the basalt pillars see on this landscape that made it so special? What stories did they tell and what events did they commemorate when they gathered by the platform? 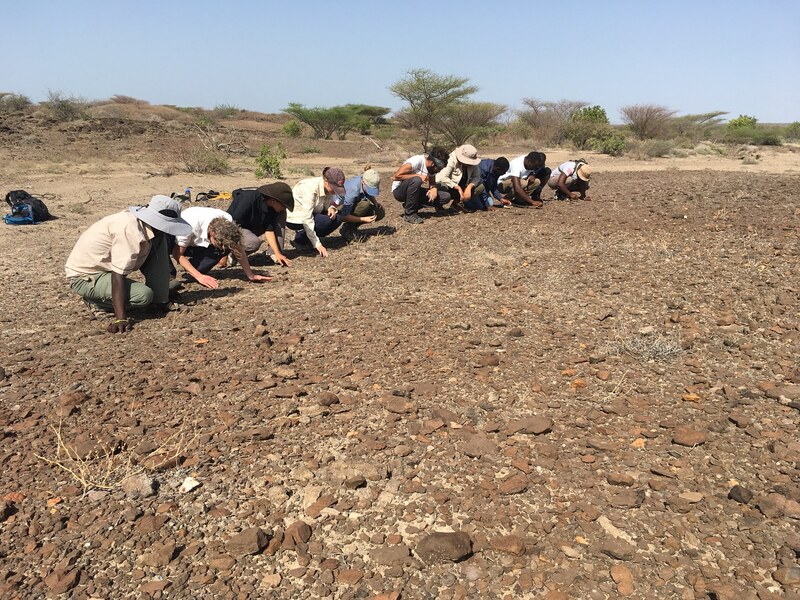 Similar rings of stones are sprinkled across the basin on both sides of Lake Turkana and archaeologists aren’t the only people who have noticed them. 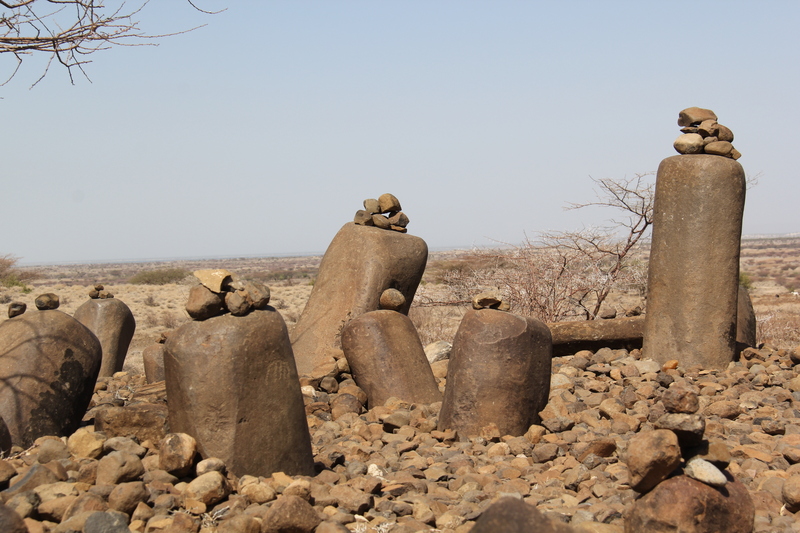 The Kalokol pillars are along the main drag from Lodwar to Lake Turkana so a lot of passers-by have see the place and tried to figure it out. 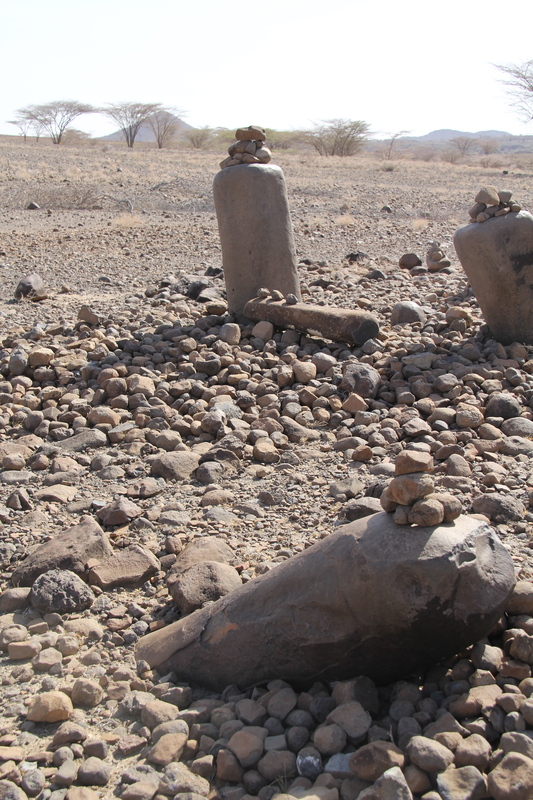 One Turkana theory is the stones are a burial site. As a sign of respect, passers by place a stone on the pile causing the platform to rise up and the pillars to look progressively shorter as they get swamped by platform stones. There haven’t been any human remains recovered from the pillar platform, so the funerary idea likely arose long after the people who used the site moved on or out. A group of people had gathered around the evening fire to dance. Suddenly the devil appeared from the desert and said he had a song to sing. If anyone laughed or cried or moved while he sang, he would turn them into stone. Francis shares the modern Turkana story of the origin of the standing stones. Maegan is suddenly concerned about leaning against an eternally happy - if petrified - dancing chief. The dancers stopped to listen to the song. Some thought it was hilarious and fell to the ground in peals of laughter. They instantly turned to stone. Nearby, several people fought the urge to weep at the song they heard, but their resistance broke down and the devil caught each of them shedding a tear, and he gleefully froze them in place. Leaning pillars at Kalokol. They are set deeply in the ground, but brutal storms, groundwater, and erosion have taken some of the pillars off the perpendicular. They really do look like people who need comfort or are enjoying a good laugh in the Turkana sun. In the middle of the stony crowd stood the Big Man, the Chief who stared the devil down as the devil sang his tune. But he wasn’t strong enough to fight off a small smile that crept across his face and the devil claimed his final victim. Today the Big Man still stands straight in the middle of the ring while the other pillars lean crazily around the periphery, evidence of the last gales of laughter heard from the Kalokol dancers. 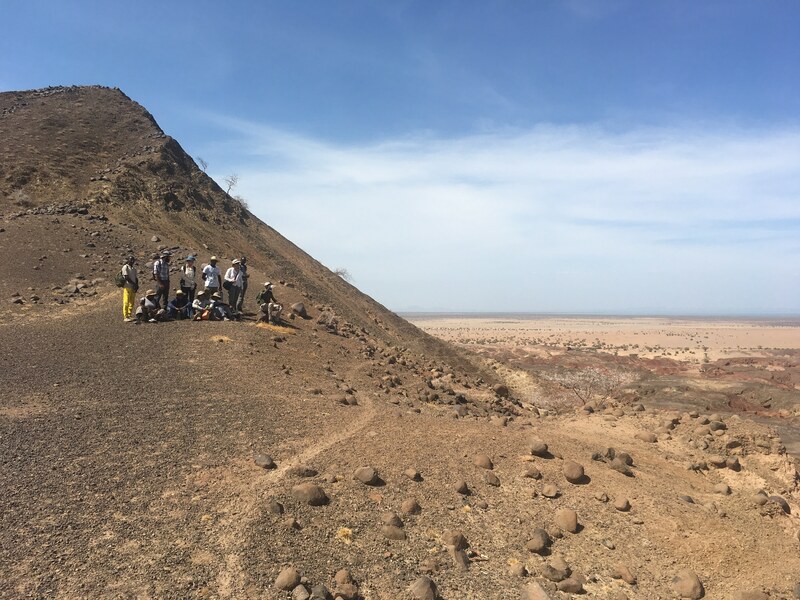 After hearing these different interpretations of the pillar site, the students spread out over the landscape, searching for pottery and lithic fragments that might be useful for figuring out who the pillar builders were and what they did in the middle of the rocky desert with their circle of stones. The Big Man pillar surveys the landscape. Those distant hills may have provided some of the raw material for the ring of stones. 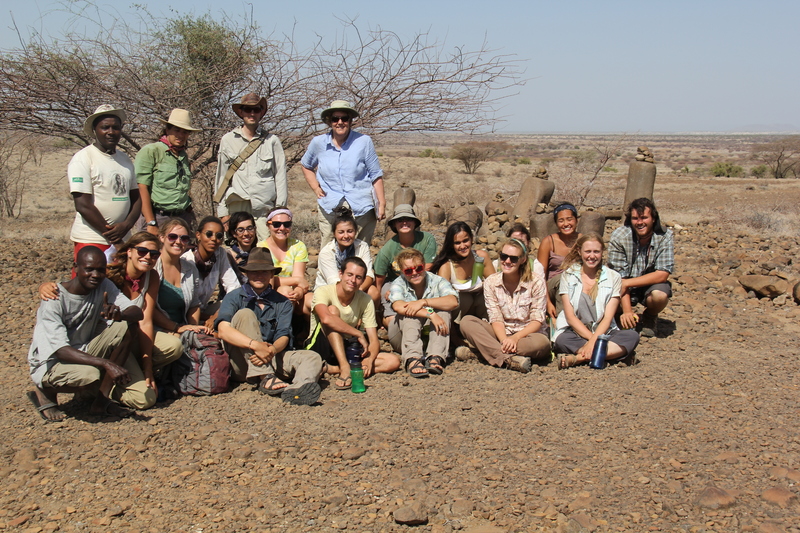 The visit to the Kalokol pillars emphasized the simple fact Dr. Brooks spent most of the module emphasizing: archaeology is not about finding and naming stone flakes, pottery fragments, and mysterious stone rings. Archaeology is the science of taking these objects, these products of human intellect and imagination, and inferring the development of human behavior from the objects found in the ground. Petroglyphs have been inscribed on some of the pillars. Archaeologists know they're old, but aren't yet sure how long after the pillars were set in place that they were etched. The meaning of the markings is equally cryptic. After a week of digging in the dirt, it was easy to lose track of the big picture, to focus on the next fine layer of sediment in the square and little else, but Dr. Brooks showed how Dr. Hildebrand had excavated test pits just as we had at Kangatotha, and was slowly piecing together the history of the site occupation. 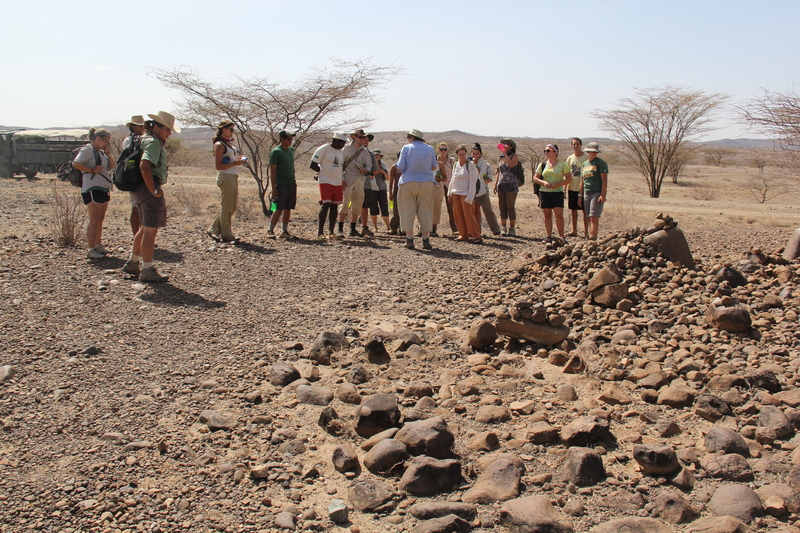 Maybe she will finally discover the purpose of this Turkana Stonehenge and get inside the heads of a people in a culture long forgotten by the current residents of the Turkana Basin. Or maybe someone will find the devil’s tracks leading back into the desert. A view towards the shores of Lake Turkana on the horizon. 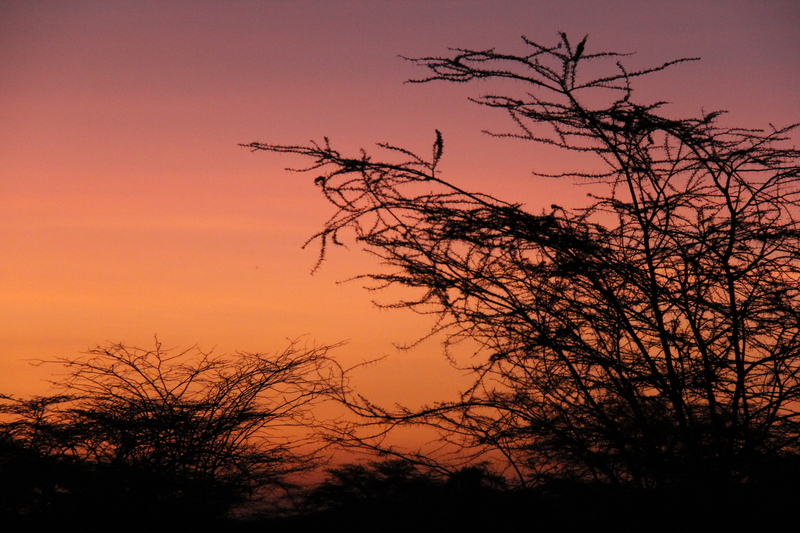 Note: Over the last few weeks, the first Kenyan national elections under the new constitution have taken place. For about a week, the presidential contest remained close as each vote was carefully tallied and the process remained as transparent as possible. The race was ultimately decided – by a hair’s-breadth – and President-elect Uhuru Kenyatta, son of the first president of Kenya, accepted the people’s call. At TBI we were far from the centers of rallies, but even in the heart of Nairobi, the elections remained peaceful. So far, the field school students have been witnesses to Kenyan history as 85% of registered voters turned out to cast a ballot on a very hot day. The energy of the still-young multi-party democracy was palpable as TBI staff members returned to their home districts to exercise their democratic right to cast their ballots and be heard. The road next to the Kalokol Pillars. The monumental site has probably been a meeting of roads for a very long time and plenty of travelers have noticed the site and tried to discern why anyone would bother hauling such massive pieces of rock across the grasslands to this spot.